Aircraft manufacturers, aircraft designers, aircraft maintenance and modification organizations, students in aerospace engineering. Snorri Gudmundsson, Department of Aerospace Engineering, Embry-Riddle Aeronautical University. From 1995-2009, Dr. Gudmundsson served as Manager of Aerodynamics Engineering at Cirrus Design Corporation. He has performed testing, analysis, and performance analysis review on variety of single and twin engine small aircraft. He is also a Consulting Designated Engineering Representative for the FAA as a Structural and Flight Analyst. "A truly excellent book on aircraft design. Unlike many modern text books, it really tells the "story" of the subject with lots of current, real-world examples, data, and cautions, along with the mathematical equations that dominate many engineering texts. On that note I’d put it in with the aeronautical engineering classics like Perkins and Hage, or Bruhn for aircraft structures. The illustrations and graphics are also first-rate. I believe that this book will find wide acceptance among practicing engineers and students." --Brian E. Meyer, Manager, Aircraft Applications Engineering, Hartzell Propeller Inc. Anyone looking for a constructive initial aicraft design guide should choose this book. It provides practical, down to earth, analysis methods and loads of reference data on existing aircraft design. Great book, covers all topics of aircraft design. A must have! I recently bought this book. It was already on my list for a while but I kept on waiting, such a mistake. What a great book this is. I should have bought it sooner. 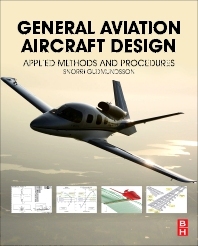 It covers all topics of aircraft design. It is great to read and the examples provide another layer of understanding. I wish I had this book at the beginning of my studies aerospace engineering. This one definitely belongs on the list of books to buy if you study aerospace engineering.